The gambs of a horse. Gamb means an animal's leg. 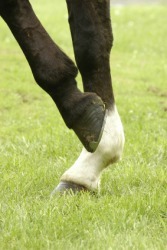 An example of gamb is the leg of a horse. "gamb." YourDictionary, n.d. Web. 21 April 2019. <https://www.yourdictionary.com/GAMB>.